injuries that can be avoided this time of year. With all of the shrieks and howls coming our way, we thought it would be a good idea to make sure they are happy ones, in keeping with the fun atmosphere of the holiday. It’s always a good idea to keep aware that the festivities may not be as fun for our pets as it is for the kids, teens and adults. Chocolate in all forms is harmful to dogs and cats. Especially darker chocolates. The culprit is theobromine, which has a mild simulative effect on us, but an extreme one on dogs and cats --causing hyperactivity, seizures, increased heart rate, and possibly death. Diet candy and other treats containing Xylitol are extremely harmful to your pet. This artificial sweetener is known to induce hypoglycemia (low blood sugar) in dogs with even the smallest dosage. Symptoms include depression, loss of coordination, collapse and seizures. Larger amounts are known to cause liver failure, and can be fatal. Some dogs and cats have been known to suffer ill-effects from raisins, grapes and types of nuts. 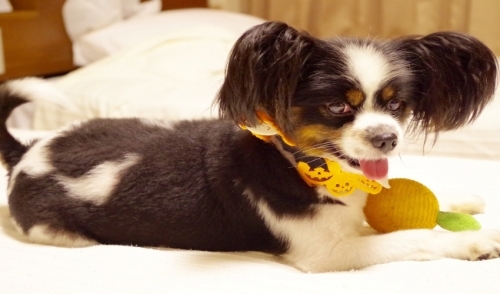 All pets run the risk of choking hazards and intestinal blockage from ingesting the various wrappers and foils associated with Halloween treats. As you decorate for the holiday, be sure to keep lights and wires out of reach of your pet. The colorful decorations and the change in your pet’s normal environment will cause some curiosity and you’ll want to keep them from getting shocked by chewing wires or hurt by breaking bulbs. Pumpkins also present a risk, especially those with lit candles inside. Keep aware of the risk that larger pets could knock them over or smaller ones could get too close to the flame and be singed. If you have a bird, be wary of using fake webbing around the house, as your pet may become either entangled or attempt to eat the material. Nobody knows your pet better than you. If you think your pet will like (or tolerate) dressing up, be sure to try the costume on a few days prior and get them used to wearing it. 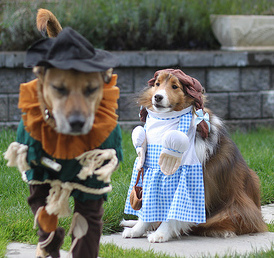 Keep in mind that the costume should not be restrictive to your pet’s movement or senses. Like with children, make sure breathing is not impeded, and that there are no choking or tripping hazards. If your pet seems annoyed or if you have any concerns about having them wear it, then consider a simple themed bandana or bow instead. One of the biggest parts of Halloween is answering the door. Again, if you know how your pets react to people coming to the door, plan accordingly. If you have any concerns of your pet reacting protectively or aggressively, then it may be best to find a quiet room as far from the front door as possible for them to relax. Give them a chance to settle in a little while before the trick-or-treaters begin arriving. Otherwise, just keep in mind that upon seeing the variety of costumes, any pet could become frightened and react naturally, by running. A pet gate across the front door is a good idea to prevent any escapes --or pursuits. If you decide to take your pet out with you, make sure you include all proper ID (collars, tags, ID chips) in the event that your pet runs off and becomes lost. However, as many pets may not be accustomed to all of the constant stimulation that may occur they may simply appreciate being left home rather than join in on the trick-or-treating.